If you share the same bond with your father, I would be happy to know about it. A happy father's day to all the fathers in the world. 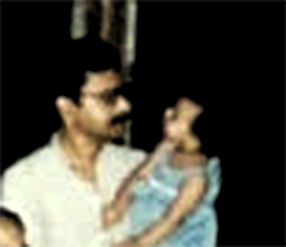 Image: The picture is of me and my father some three decades before. P.S. I am sorry to the non-Hindi readers of this blog for not being able to translate the poem in English. March 31st, on the eve of famous April A to Z challenge, I was busy writing out small drabbles to post in the challenge. The list was almost finished for the topics I was planning to write on. The stories were decided too, about the common issues women face like domestic violence, wage inequality, women being pestered by in laws to deliver a boy and so on. Any lawyer, social worker, marriage counselor or psychologist and women who are facing it would agree here that these issues do exist, that too commonly. The stories I planned to write initially, were not the ones I heard from somewhere. These were the real life stories from people I know. When I tried to find my name in the registration list of AtoZchallenge site, I found out it wasn’t there. Accidents happen. GK had been motivating me and waiting for me to participate in it again. When I commit to something, I put all my heart and soul to finish it. Hence this challenge was the only hope and motivation for me to get into the routine blogging. Shilpa, one of the old blog-mates, who participates in AtoZ each year came forward for my support like always. I decided to step into it. 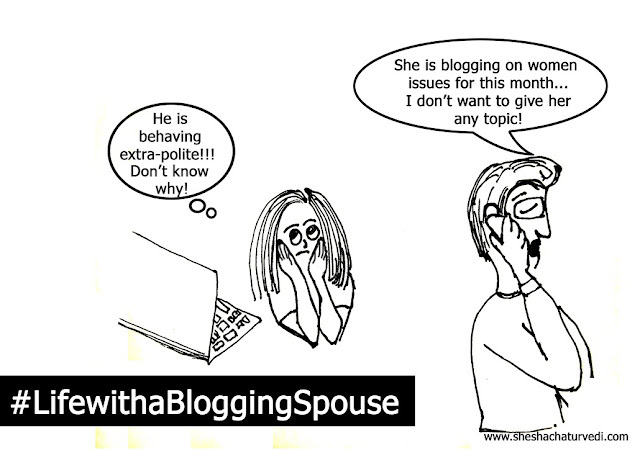 Sometimes you need a word of inspiration from fellow bloggers and friends to get going. I started with the topic Abuse. I realized many people around me didn’t know that women today still go through a lot of abuse, verbal, physical and sexual in their relationships. Thus, my journey had begun, with a thought that by writing about these things, if I could compel just one person to think rationally, it will make a lot of difference. The change in perception of one person facilitates discussions in his/her group of family and friends. And hence, a single person can bring the required change. After writing the third post, I started feeling low, I didn’t want to write about them anymore. Women issues are depressing, and thinking and writing about them daily is even more depressing. I realized along with stories, I needed to write constructive posts, that have solutions. Hence, I removed one restriction from my theme of women issues i.e. 100 word stories based on real life. I planned to introduce humor through doodles on less relevant women issues. To my amazement, humor attracted more people. And writing about serious issues after them, maintained blog traffic. Regular visits from fellow-bloggers, friends, family and especially my mother (who commented on my posts in Hindi) kept my spirits high. Thank you to each one of you (new and old blog-mates, new and old family, new and old friends) for being there with me throughout this challenge. Again GK was a huge support who also reviewed some of my posts along with my sister. This was my third time participation in AtoZ challenge. Like always this challenge has helped me in pushing myself to write daily and write better. - Living a life of gratitude, G Angela David, Inspirational and contemplative books. - Kalpana writes Kalpana, Tour of Delhi (also my hometown) with mesmerizing photographs. -Shalz mojo, Shalini Baiswala, Book recommendations (many of which are in my to read list). A big thanks to fellow blogger, Rajan (who blogs at: Shoot the breeze) for his constant support through visits and sharing his views throughout this challenge. Abuse: the tale of an independent woman: Story based on real life. I didn't know any other way to vent out my anger and rage other than writing these lines. Hopefully someday world will be a fair place, atleast for humans! Doodle inspired by true story. Congratulations to all fellow bloggers who aced it! A phoenix, burning its own existence and then rebuilding itself from its own ashes.. I am into constant development of myself. What can you learn from the success of Salesforce CRM?